That’s right. 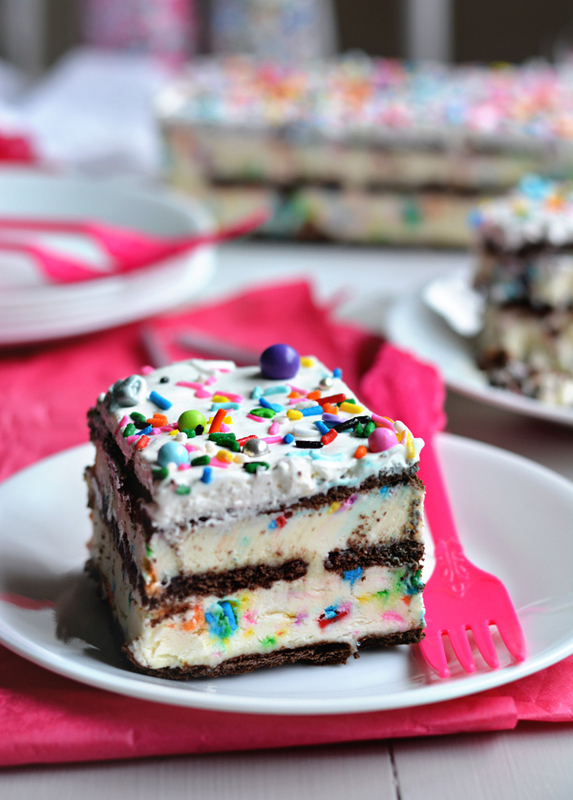 Birthday cake LASAGNA. 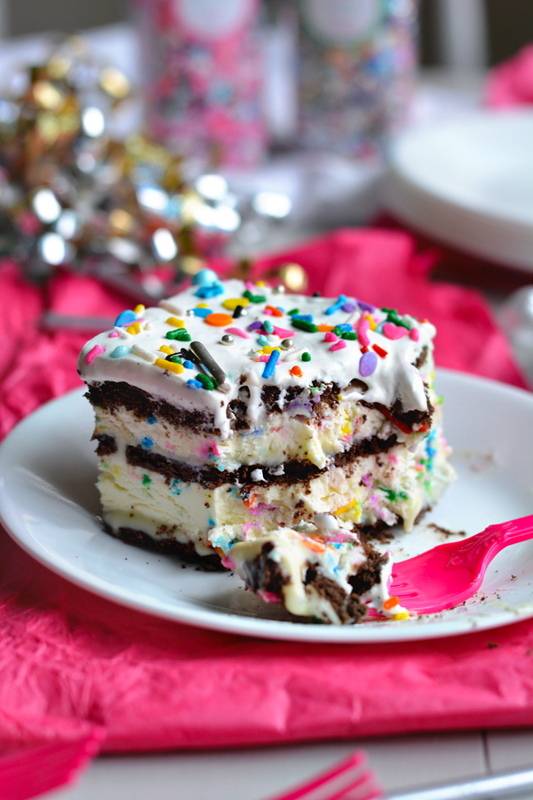 Which is a fun name for icebox cake. 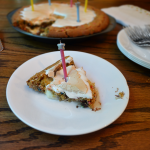 The best thing about this Birthday Cake Lasagna is that it’s from a cookbook called No-Bake Treats by my friend Julianne of the blog Beyond Frosting! 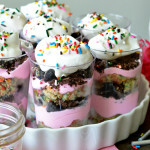 She is seriously the queen of no-bake treats, which you are probably aware of if you’ve been by her blog. 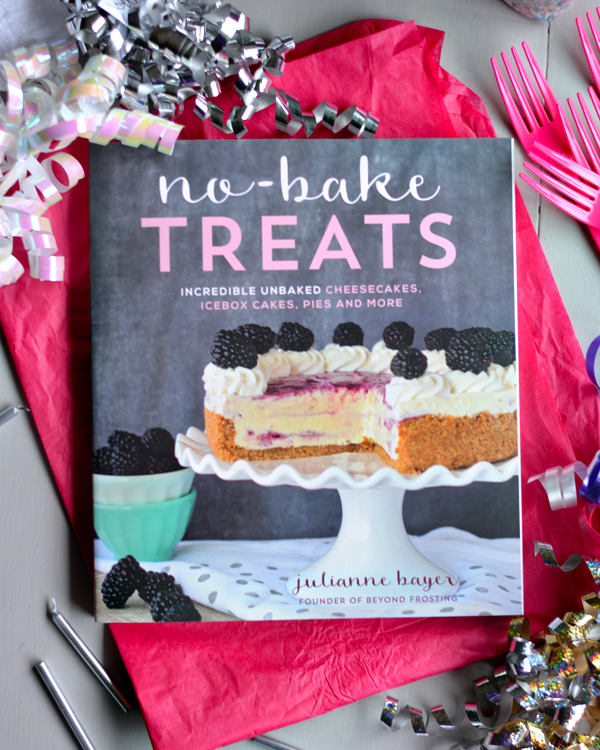 This book has SO MANY fantastic no-bake recipes, from icebox cakes to popsicles and ice creams. I’ve been avoiding my oven like nobody’s business this summer, so to say I was EXCITED about getting this book in the mail would be an extreme understatement. It stays hot in Alabama well into the fall, so I can’t wait to make as many things from this book as I can! 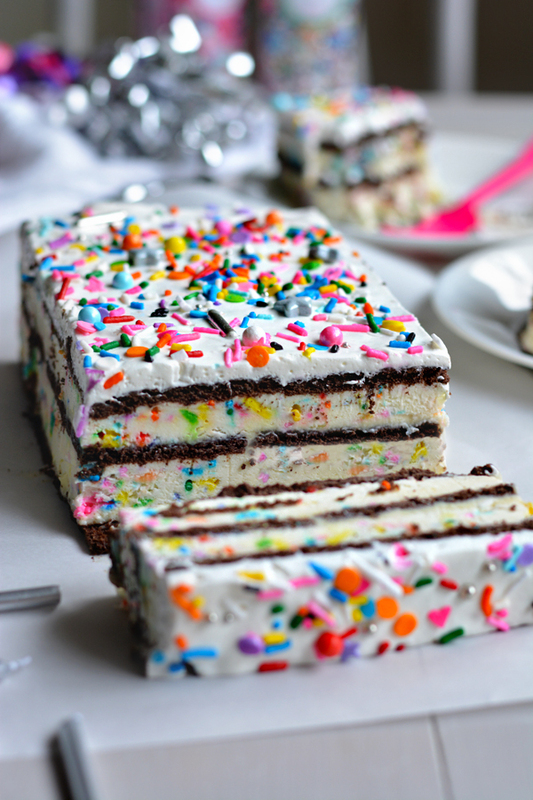 When I saw this Birthday Cake Lasagna covered in sprinkles I knew I had to make it first. Obviously. It starts out with a birthday cake-flavored pudding *from scratch*, which has always been a little intimidating to me, but the pudding turned out perfectly! Then there’s the birthday cake whipped cream (genius), and a cream cheese filling that uses some of the pudding and the whipped cream to make a super fluffy mousse! The original recipe calls for Belgian waffles crisps for the layers, but graham crackers if you can’t find those at your grocery store. I knew I probably wouldn’t be able to find them and opted for chocolate grahams instead. Measure out all of the ingredients for the pudding prior to starting. Place the egg yolks in a separate bowl. In a medium-size saucepan, combine sugar, vanilla cake mix, cornstarch, salt, heavy whipping cream and vanilla extract. Heat the mixture on the stove top over medium-low heat, whisking constantly to dissolve the dry ingredients in the mixture. Once the mixture is warm (but not boiling), pour about 1⁄4 cup (59 ml) into the bowl with the egg yolks and whisk vigorously to temper the egg yolks. Immediately pour the egg yolks into the saucepan and continue whisking over medium-low heat to prevent the eggs from cooking. Whisk until the pudding starts to thicken. It will happen very quickly. Strain the pudding through a fine sieve into a medium-size bowl. This step is optional, but it will help catch any lumps of ingredients that did not get blended. Immediately cover the top of the pudding with clear plastic wrap (directly on the surface of the pudding) and poke a few holes with a toothpick. Allow to cool on the counter for at least 1 hour before refrigerating. Refrigerate for 2 to 3 hours until the pudding has cooled and is firm. Place the mixing bowl and whisk attachment in the freezer for 5 to 10 minutes to chill. Pour the heavy whipping cream into the chilled bowl and use an electric mixer to beat the heavy cream on medium-high speed until the cream gets bubbly. Slowly add the vanilla cake mix and continue beating on high speed until stiff peaks form. 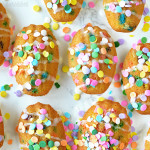 Next, gently fold the sprinkles into the whipped cream with a spatula. Separate out 2 cups (150 g) of the whipped cream for the filling and save the rest for the top layer of the dessert. Keep the whipped cream refrigerated while you are completing the remaining steps. Beat the cream cheese on medium-high speed for 2 to 3 minutes until it’s light and fluffy, and then scrape down the sides of the bowl. Add 1 cup (75 g) of cooled pudding into the cream cheese and beat on low speed just until combined. Lastly, add the 2 cups (150 g) of prepared whipped cream and fold it gently into the mousse using your spatula. Line the bottom of a 9-inch (23-cm) square dish at least 2 1⁄2 inches (6 cm) tall with parchment paper. Line the bottom of the dish with 1 layer of Belgian waffle crisps, cutting if necessary. Using half of the remaining pudding, spread a thin layer of pudding over the waffle crisps. 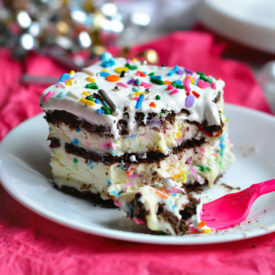 Top this layer with half of your cake batter mousse. Repeat these steps for the second layer using all of your remaining pudding and mousse. Lastly, add a third layer of waffle crisps and top with the remaining prepared whipped cream. 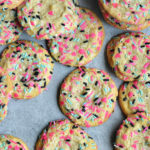 Garnish with sprinkles. 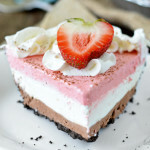 Cover and return the prepared dessert to the refrigerator for at least 3 to 4 hours to allow all of the layers to set. This “lasagna” looks SO incredibly swoon worthy and delicious! The way you decorated is so cute, too. Love it! 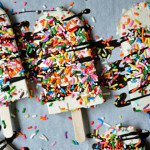 Looks delicious and perfect for this hot and humid time of year! Swoon! 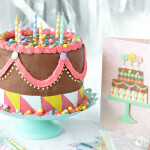 Im making this for my birthday next year!